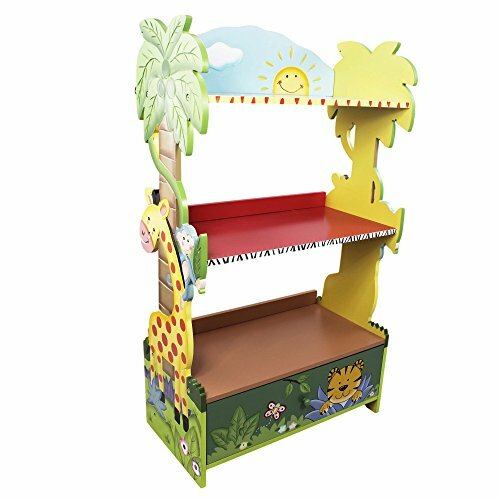 Catch Jungle Fever, with Fantasy Fields' Sunny Safari Bookcase. Three hand carved, hand painted shelves of fun, this book case is creative and unique as it is essential. Vivid colors and hand sculpted animals pop off the wood work of the book case, bringing it to life. Spacious drawer below offers room to tuck away keep sakes such as photo albums or nick nacks. With lead free paint and quality craftsmanship, this bookcase promotes education, organization, and safety. Help your child display their awards, favorite reads, and stuffed animals with this one of a kind book shelf. Some assembly required. Perfect for ages 3 and up.